We’re often told by their supporters that the bishops and archbishops who sit in the House of Lords have been there from the start, that they’re not cuckoos, that they’re whittled into the woodwork. Religious leaders were certainly consulted regularly by Saxon kings, and the Great Councils called by post-1066 English monarchs would typically include archbishops, bishops and abbots. 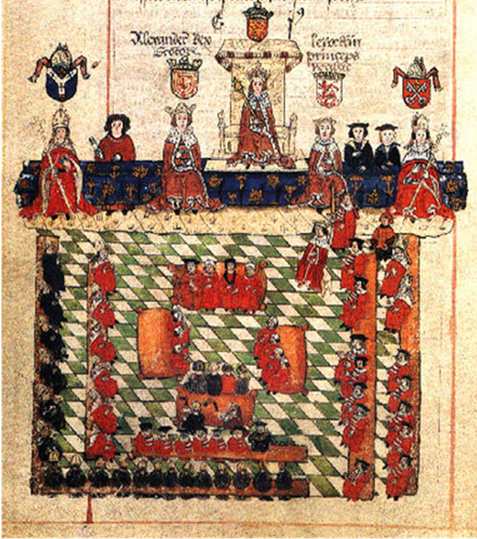 Moving on a bit, we know Edward I’s ‘Model Parliament’ included at least 70 abbots and that, in fact, until the Dissolution of the Monasteries under Henry VIII, religious leaders made up the majority of Parliament. For practical purposes, under the feudal system religious boundaries were often adopted for secular purposes. The country was already divided into parishes and dioceses, why add another layer of administration on top of it? With these units in place, it was a short step for medieval rulers to team up with local religious establishments to help administer the land. As major landholders and administrators, certain duties were placed in the hands of churchmen, just as they were for lay lords and barons. These included the collection of taxes, duties and fees, and the provision of soldiers for the king’s army. In a survey carried out by the Treasury of the nation’s stock of fighting men in 1166, for example, the Archbishop of York was required to confirm how many knights he had patronised by endowing them with land. Whenever the king needed to raise some hard cash to fund big expenditures, usually his latest war, he would call together major landowners in a Parliament to ask for their support. After all, they would be the ones who had to raise the cash and mobilise the men. With vast swathes of land and resources under their command, the Church was prominent among those called. The best part of a millennium ago, the Church was invited into Parliament because it made secular sense; the king needed men and money, and the Church could provide them. None of that original purpose now remains. King Edward I presiding over his Parliament c.1300. To his left are the Lords Spiritual on the left (with Bishops in red and Abbots/Priors in black).